Silicon Valley and NYC aren't the only places with a lot of foreign tech workers. 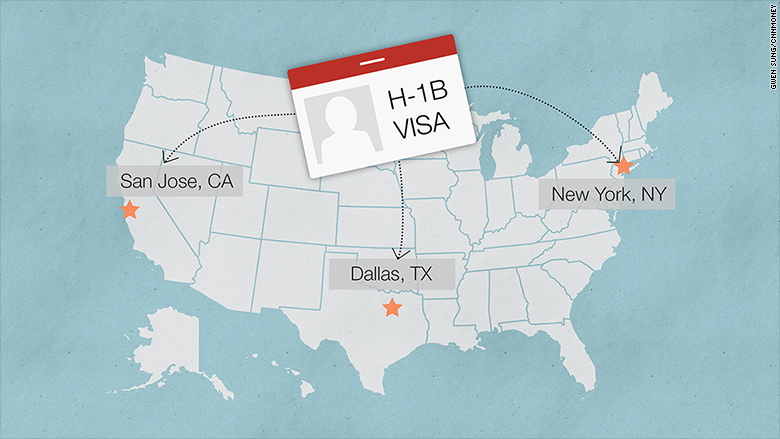 According to a report released Thursday by Brookings Institute, metro areas like Dallas, Detroit and Durham-Chapel Hill have a big share of workers on H-1B visas, the most common visa for highly skilled foreigners. On Wednesday, the application period for H-1B visas opened up, but there's an annual quota of 85,000. If the demand during the first week exceeds the cap -- last year there were 172,500 applications -- the U.S. Citizenship and Immigration Services dolls out the visas at random via a lottery system. The report looked at H-1B visa recipients in 2013, the first year that the lottery system was used since the recession and the only year that the USCIS has released data for. Unsurprisingly, the New York metro region had the most visa recipients, with 29,161. It was followed by Dallas, which had 19,824, largely due to tech firms like Texas Instruments (TXN), which is headquartered there, according to Brookings analyst Neil Ruiz, who co-authored the study with Jill Wilson. San Jose, Calif., Washington, D.C., Chicago and San Francisco all received more than 10,000 approvals. 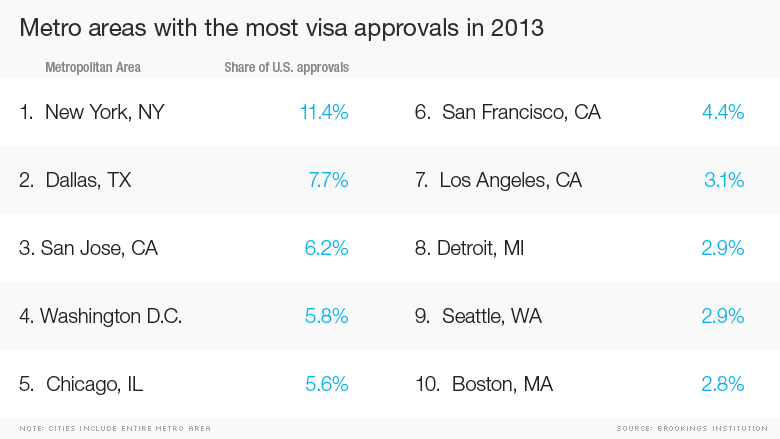 These metro areas had the most H-1V visa recipients in 2013. "Many of our advanced industries are in high need of foreigners," said Ruiz. He noted that the Durham-Chapel Hill region had 23 H-1B visas approved for every 1,000 workers in the area. "That's a really high share," said Ruiz. "They really rely on the H-1B visa." The area is, after all, known as the "Research Triangle" with colleges like Duke University and UNC Chapel Hill. It's also among the top 20 metro areas for foreign student visas from 2008 to 2012. The fact that Detroit made the top 10 shows a strong need for STEM workers who are essential to rebuilding the city post bankruptcy, said Ruiz. The lottery process means that many employers -- and foreign workers -- are essentially gambling with their talent. That's why in recent years, as the federal government has failed to pass a startup visa, local governments have been lobbying to introduce workarounds. In 2014, Michigan Governor Rick Snyder proposed a regional visa program to bring in 50,000 high-skilled immigrants to Detroit in five years. States like Massachusetts and, just last week, Colorado -- have rolled out Global Entrepreneurs in Residence programs. These programs, which require outside funding, help foreigners get around the strict quota: When sponsored by a nonprofit research institution, they're exempt from the cap.